Space shuttle Discovery lifts off Launch Pad 39A atop twin columns of fire, creating rolling clouds of smoke and steam in its track. 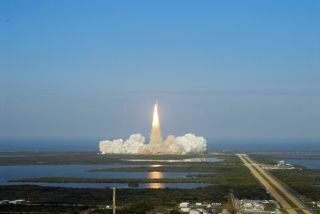 Launch of the STS-133 mission was at 4:53 p.m. EST on Feb. 24, 2011 as seen from the roof of NASA's 52-story Vehicle Assembly Building. This story was updated on March 2 at 2:45 p.m. ET. President Obama and Congress have two more weeks to pass a new budget before the U.S. government shuts down for lack of funding. Today the U.S. Senate passed a House temporary spending bill to keep the government running until March 18, giving the politicians a repreive in their feirce budget debate. But if lawmakers do not pass a larger funding measure within two weeks, the government is still at risk of having to shut down. If that scenario does come to pass, a government shutdown would likely disrupt programs not only across the nation but into space. All NASA workers essential to the space shuttle and other critical missions would continue to work, but analysts and researchers involved with NASA's many space probes might be among those who are sent home. As of today (March 1), U.S. lawmakers had yet to pass a budget for the 2011 fiscal year, which began last October. The country has been operating under a stopgap measure called a continuing resolution that extends last year's funding. Unless Congress and Obama can agree on a new budget to operate after the two-week stop-gap, the government will shut down and all government workers considered nonessential will be furloughed until funding comes through. Even if the federal government does shut down, all NASA workers considered essential to the mission would stay on, so Discovery wouldn't end up stranded in space. That means most Mission Control staffers managing both the space shuttle and space station programs would continue working as usual. "It goes without saying, but the astronauts themselves are considered essential personnel," added space history and artifacts expert Robert Pearlman, editor of collectSPACE.com. "While certainly disruptive, costly and personally burdensome, if there were a shutdown, I would expect NASA to treat crew safety aboard the International Space Station as an essential function and top priority," said Scott Pace, director of the Space Policy Institute at George Washington University in Washington, D.C. Yet support personnel such as cafeteria workers, office managers and secretaries would be sent home, which could certainly have an impact on the complex workings at NASA. This wouldn't be the first time such a situation occurred. In November 1995 the federal government famously shut down while President Clinton negotiated with a Republican Congress led by House Speaker Newt Gingrich. That shutdown coincided with the STS-74 mission of the space shuttle Atlantis as it visited Russia's Mir space station. "The STS-74 crew had just docked to the Mir space station when the government shut down," Pearlman said. "All nonessential personnel were furloughed, which basically meant that from a mission perspective, everyone who was needed to fly the mission was considered necessary, but anyone who was not associated with actually operating the mission and flying it out successfully had to go home." That included NASA's public affairs office, which runs press conferences and distributes information to the media and the public. "There were no daily status reports, and media briefings were held unofficially outside of NASA centers at first, and then in limited fashion on-site," Pearlman said. "This occurred at the same time as the burgeoning of the World Wide Web, which led to the creation of an unofficial STS-74 website to distribute more information about the mission." If there is a government shutdown, NASA programs beyond the space shuttle are likely to be similarly affected. "Obviously there’ll be an impact if there's a government shutdown on the activities at NASA," said Roger Launius, senior curator in the Division of Space History at the Smithsonian Institution's National Air and Space Museum. "How significant that impact would be is dependent on a variety of factors, not least of which is how long it's shut down." NASA scientists and researchers analyzing data beamed back from the space agency's numerous space probes would probably have to go home. Yet workers who were critical to the continued functioning of those probes would probably be counted as essential. Pearlman said, "Anyone associated with actually operating a spacecraft, where if they did not do their job they'd be putting into jeopardy U.S. assets — those would be considered essential personnel." Experts say it's more likely that lawmakers will compromise on a new spending measure in time to prevent a shutdown this week. "It looks to me like everybody's trying to solve this at least short-term, and hopefully that will happen," Launius told SPACE.com. "We believe an agreement will be reached to prevent a government shutdown," said a spokeswoman for the space agency, Katherine Trinidad. "The safety of our astronauts is our top priority, and we will take the steps necessary to ensure they have the proper support."